I’m really excited about Kregel Academic’s new book, The Handy Guide to Difficult and Irregular Greek Verbs. After my fourth semester of Greek I still felt as if I really struggled when reading the Greek text. My professor at the time suggested that I go back and learn the most common irregular Greek verbs and commit them to memory before moving on to the next class. To be honest, after starting the process the following summer, I quickly became frustrated at the seemingly impossibility of identifying which irregular verbs would be considered the most common ones! When I transferred the following fall I decided that my best bet would be to just start second year Greek again under a new professor– perhaps it was just a clash of learning vs teaching styles I reasoned. Unfortunately, I quickly became aware of the fact that a new professor was not the solution and after taking 2nd year Greek again I simply decided that I was never going to be a Greek Scholar and would simply rely heavily on those who were.In hind sight, I may have done a little better had I taken my professor’s advice and studied up on common irregular verbs. Today, nearly 20 years later, I still struggle with difficult and irregular verbs. So you can imagine the sheer joy that I felt when I received a review copy of The Handy Guide to Difficult and Irregular Greek Verbs in the mail! The best part of this book is that Part 1 is arranged by frequency– and this simple departure from the typical reference is pure genius! It didn’t take me a long time to scan the list and, upon seeing exactly how short the list of more frequent cases was, realize that if I had this book twenty years ago I would have been able to move on past third year Greek . This was an utterly astounding realization! The first three lists (categorized by forms occurring between 1000-200 time, 199-100 times, and 99-60 times) was quite literally about the size of the vocabulary lists that I would memorize on a weekly basis with little to no problem at all. Could it really have been that simple? It appears so. In Part 2, the authors go on to list those same verbs alphabetically with their compounds. This is followed by two handy appendices, The first on the conjunctions of εἰμί, εἶμι, and ἵημι, and the second appendix containing a few tips in reading the perfect and pluperfect indicative and the operative mood. Though this book is small it will be a mighty weapon in your arsenal of Greek aids to help you battle those pesky doubts that all but a very few face when studying Greek. Jon C. Laansma is associate professor of ancient languages and New Testament at Wheaton College in Wheaton, Illinois. His writings include The Letter to the Hebrews: A Commentary for Preaching, Teaching, and Bible Study. 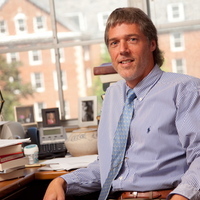 Randall X. Gauthier, Ph.D. (2010), University of Stellenbosch, is an independent researcher living in San Antonio, Texas. His writings include “Examining the ‘Pluses’ in the Greek Psalter: A Study of the Septuagint Translation Qua Communication,” in Septuagint and Reception (Brill, 2009). Yes! I totally need this man. We’re starting a ministry school here at the church and I still struggle with this. And I took four years of Greek! This looks like a good resource. I dropped out after one semester and realized that Greek wasn’t my strength.